It is ironic that a horse-thief later played a key role in the operation of Tocal as a leading Australian horse stud. John Kidd was 25 years old when he received a life sentence in Cambridge in 1829 for horse stealing. He arrived in Sydney later that year on the Norfolk and after a while was assigned to Tocal. He was well behaved and received his Ticket of Leave for the Paterson district in 1837 and married in 1840. John received a Conditional Pardon in 1845 on the recommendation of two magistrates and his former Tocal employer Felix Wilson. By 1856 John, his wife and family were back living and working at Tocal. This was the start of an association between the Kidds and Tocal that continued unbroken for three generations. 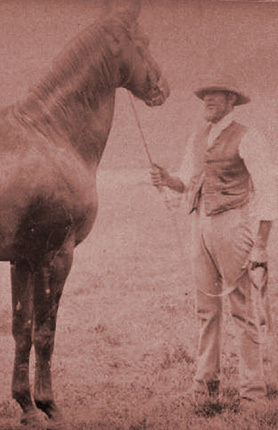 Right: John Kidd (the younger) with Thoroughbred horse at Tocal. John's father, also named John, was a Tocal convict who successfully rebuilt his life. John and his wife Anne lived at Tocal until their deaths in 1881 and 1900 respectively. Their sons William and John grew up at Tocal, married and worked there all their lives as stud grooms. Like their father before them, they were the backbone and mainstay of the Reynolds' family cattle and horse stud operations. At this time Tocal was a leading Australian Hereford cattle and Thoroughbred horse stud. The contribution to the success of Tocal by emancipated convict John Kidd and his descendants has been largely unrecognised. It is an excellent example of a convict rebuilding his life after transportation.